Wireless Hacking is more efficient if we know the plot or attack flow of your target. There are a lot of wireless hacking tools, they stand for particular exploit and method though. Because nowadays I could not find a one package or framework which is able to hack wireless on all vulnerabilities. We could not just fire random tool to hack the target, right? we need to gain some detail information about target and it’s vulnerabilities. Some tools you may familiar with, to audit or scan target is port scanning using NMap. Nmap is great, it is used for various target from target next to you until other side of the world you’ve never see. But, Nmap only does reconnaissance, for some action you need additional tool to launch attack, Metasploit is the one most popular. Today i introduce you a tool which is has a rich features, it is AIRGEDDON. 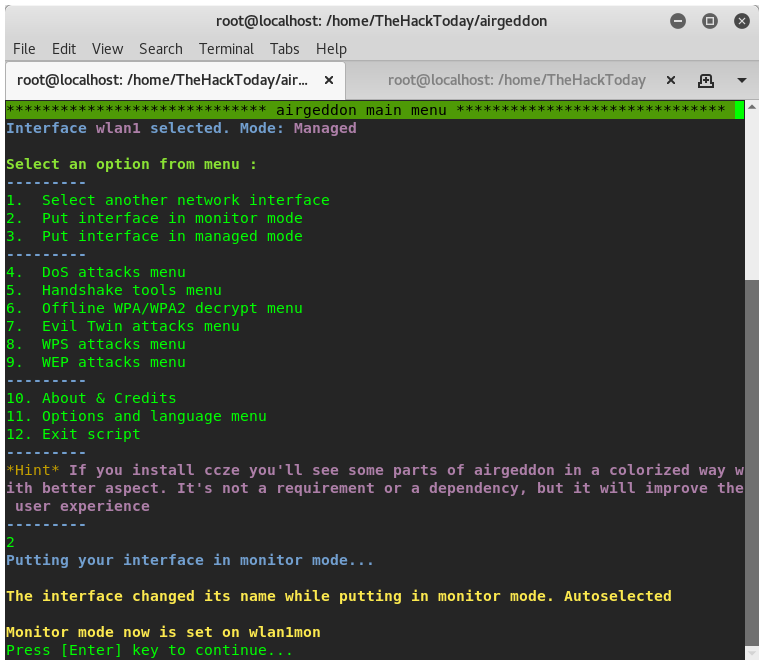 Airgeddon is written in bash and multi-use for Linux system to audit wireless networks. Airgeddon is developed by V1s1t0r1sh3r3, thanks to this dude for his great works. You could find his airgeddon project on Github. Alright let’s jump into tutorial. In this tutorial i will explain steps from installing to cracking the WPA/WPA2 from captured handshake file. First time run, airgeddon will do check our operating sytem, root access, necessary tools or packages and the update check. 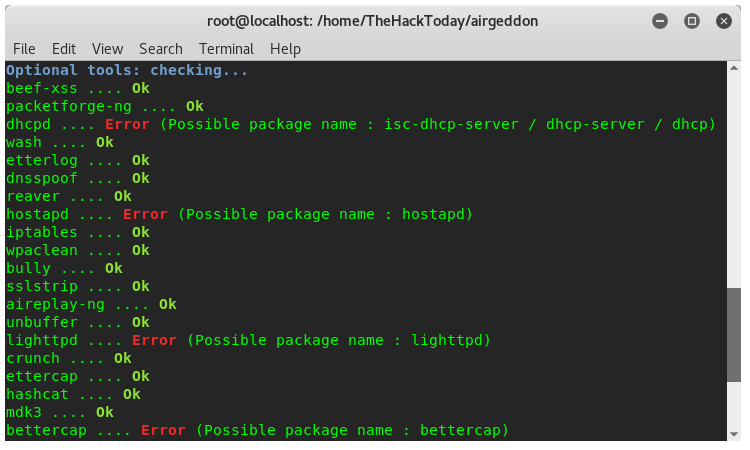 You need to install the missing packages in order to make airgeddon running well. Now, launch the airgeddon.sh. 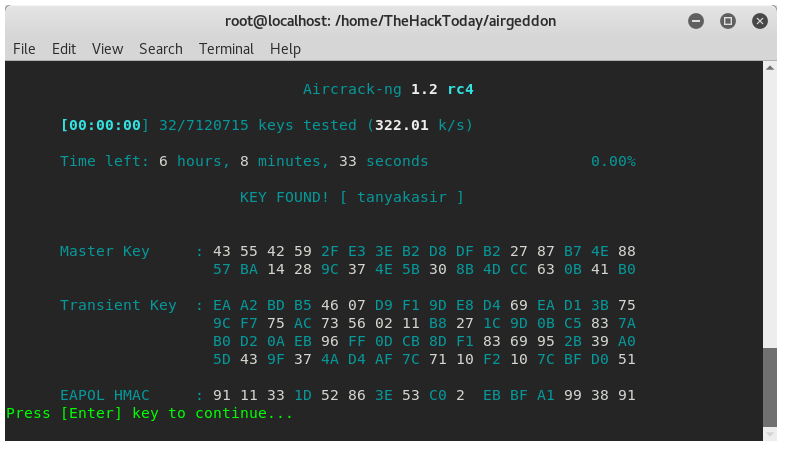 Comeback to airgeddon terminal window and hit Enter, airgeddon will detect our wire/less interfaces. Select your desire network interface by hit its number on list. I chose wlan1 on list 3. Here you will bring into airgeddon mainmenu, choose option 2 to put interface in monitor mode. First we i want to capture some handshake, choose options 5. Now you will bring to handshake menu. Choose option 4 to explore and select the target wifi. After that you will be asked to choose whether using aireplay or mdk method to deauth clients to get the handshake. I choose aireplay. When you get the handshake back to the main menu. From the main menu choose option 6. Offline WPA/WPA2 Decrypt menu. Then choose option 1. Enter the path of wordlists file, i use the built in kali wordlists, rockyou.txt. And wait until the key found as seen image below. Violaa, we got the WiFi Password. And heres come the conclusion. Airgeddon has a lot features which you can explore by your self. What we have done here is just cracked the encrypted WPA/WPA2 wifi password. The main key to succces of cracking is about having a powerful dictionary files.